An Oak tree commemorates the coronation of King Edward VII in 1902. Edward VII was crowned in August 1902, some months after the death of his mother Queen Victoria, and about two weeks after he had suffered from appendicitis, which was, unusually for the era, operated upon successfully. He assumed the title, among others, of Emperor of India. 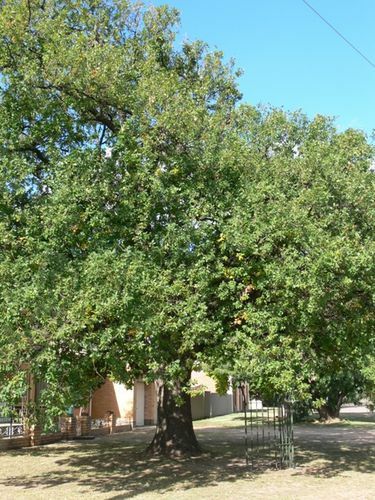 Although the business places were not shut in Euroa on Saturday last it did not materially affect the attendance at the dedication of the "Coronation Oak" at the intersection of Kirkland and Templeton streets, by the President of the Shire. The school children and cadets, about 300 strong, fell in at the Shire Hall, and marched down Kirkland street, under the charge of Lieut. Lee, and their respective teachers. On reaching the oak the Union Jack was hoisted, and saluted by the cadets, the assemblage, which must have been quite 500, singing the National Anthem. Euroa Advertiser (Vic), 15 August 1902.